Learn how to create a social media strategy that stands the test of time with these crucial steps. Let’s start of by saying that I love country music, and the fact that I was offered a chance to speak at a Nashville marketing conference, well, that was just icing on the country cake. 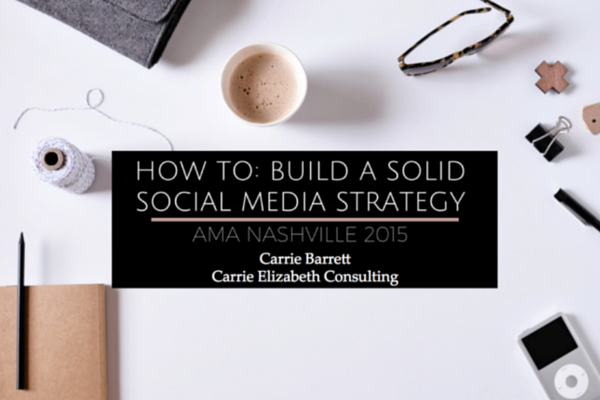 I had the privilege of speaking at the AMA Nashville marketing conference where I hosted a 2-hour workshop titled “How to create a social media strategy that stands the test of time”. The workshop was interactive as we discussed the six pillars of success that when created strategically, can hold up a lasting strategy that evolves with the changing landscape that is social media. The attendees were fabulous, and the two hours flew by as we explored the intricacies of social media and how all businesses can create a solid strategy. The six pillars discussed are outlined below, and the full presentation is available to view on the SlideShare deck below. If you have any questions, please contact me via the contact page, or leave a comment below. … and one fun photo of my husband and I just because it was Nashville.